The Chiropractic Pillows use a special density foam in an Orthopedic design chosen by a Chiropractor to provide the best in comfort and cervical spine support. Extra breathable, high grade memory foam Made in the USA. Does Not Contain Mercury, Lead, and Other Heavy Metals. 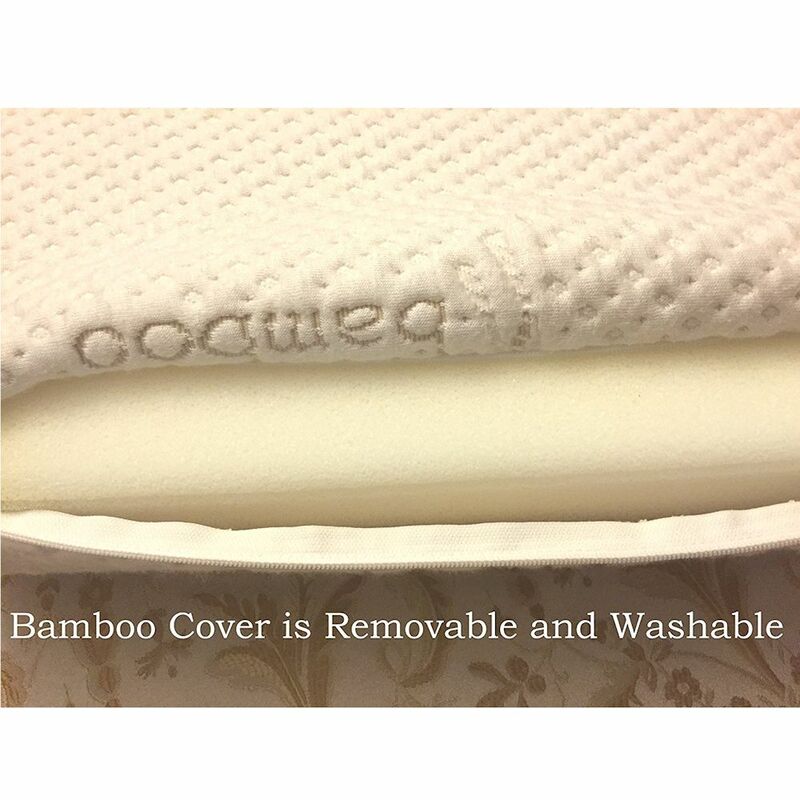 Our Pillows are made Without Formaldehyde. Three sizes from kids to adults. 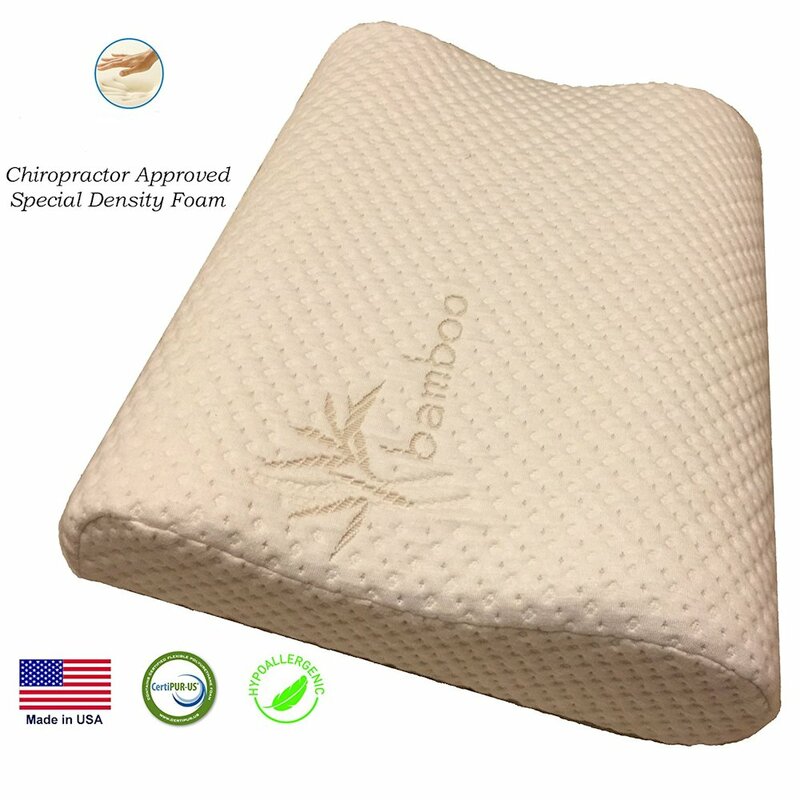 Using an ergonomic, time tested design, high quality, healthy memory foam, and offering correct fit for any size, the chiropractic pillows are the perfect compliment to your care. 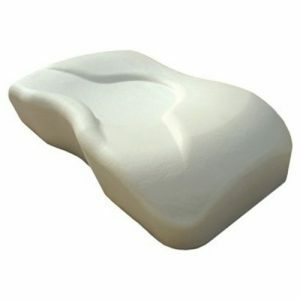 From injury to recovery and rehab, these pillows help your neck pain through all stages. Only an evaluation by a health care professional like a Chiropractor can determine the source of your neck pain or stiffness. If there is no apparent cervical injury involved like whiplash, a fall, or a sports trauma, and if other conditions like a tumor or infection have been ruled out, treatment should be geared towards prevention of long-term neck pain. With many issues involving acute pain as well as chronic problems from poor posture and previous injuries that have not healed properly, the Chiropractic Pillows can help as part of the solutions to achieving better health and alleviation of symptoms, especially waking with neck stiffness and/or headaches, even jaw pain. Certain health problems that are often reported in association with abnormal postures include tension headaches, overuse syndromes, easy fatigability, decreased sports performance, and a decreased healing capacity after injury. Strain on soft tissues of the cervical spine (muscles, tendons, ligaments) during sleep puts the neck at risk due to stress from poor biomechanics and improper support. Poor sleeping posture represents a form of sustained stress, which can lead to problems with the neck muscles and spinal alignment. If you sleep on your stomach or on a pillow or stack of pillows that do not support the neck properly, this can place excessive pressure on muscles and ligaments when they are most vulnerable. To prevent spinal instability, these soft tissues have to work harder all night and can be easily fatigued, irritated and inflamed by morning. 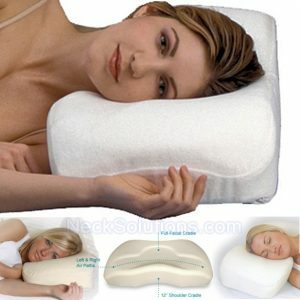 How Can The Chiropractic Pillows Help? Often, exercises and stretches along with Chiropractic adjustments are recommended to build up stability, help heal muscles, ligaments, and restore motion to tight, stiff joints. 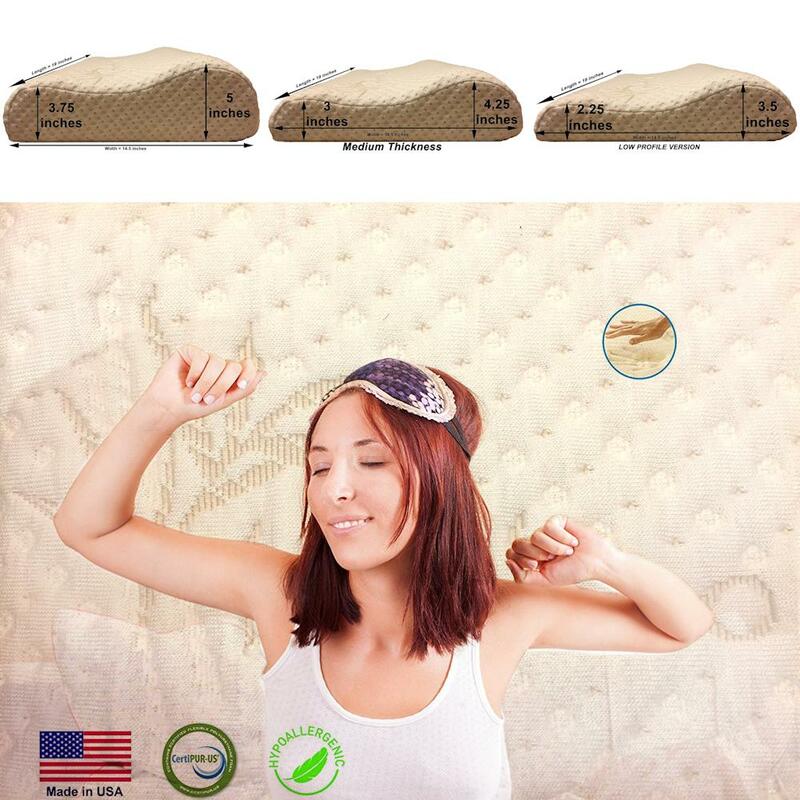 In addition, the pillows can help protect your neck while you rest and sleep. Considering we spend about a third of our life sleeping, it is wise to make sure your sleeping posture is helping instead of hurting your neck. Chiropractors often see results of neck injuries where patients may experience muscle spasms, neck pain, headaches, shoulder and neck pain, nausea, blurred vision, ringing in the ears, dizziness, concussion, limited neck motion, numbness, or reduced ability to hold the head erect. 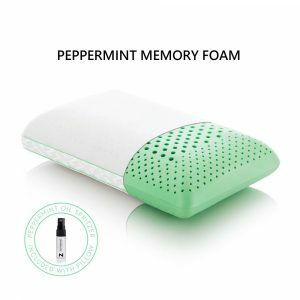 In these cases a comfort and support from the Chiropractic Pillow can help through the healing process and allow more comfortable rest. To use the gentle traction feature of the pillow, position the edge of your choice under your head and touching your shoulders. Bend your knees and push upward slightly with your feet so the back of your head sinks into the middle section. Now straighten one leg, then the other. 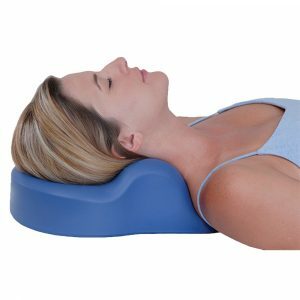 This action will pull the neck downward creating a mild traction as the head is held gently but firmly by the therapeutic edge. This results in a relaxation of the neck muscles, less irritation to nerves and aids in natural neck pain relief. Good quality memory foam can help you gradually get used to a cervical pillow and accommodate different levels of neck spasm. With spasm of the neck muscles from injury or loss of the natural curve of the cervical spine, a gradual use towards the normal ergonomic positioning may be beneficial. Many will initially find the pillow comfortable using the lower edge of the pillow, but there is a higher edge, and this can be used for a higher loft in side sleeping, or just therapeutic rest when on your back. 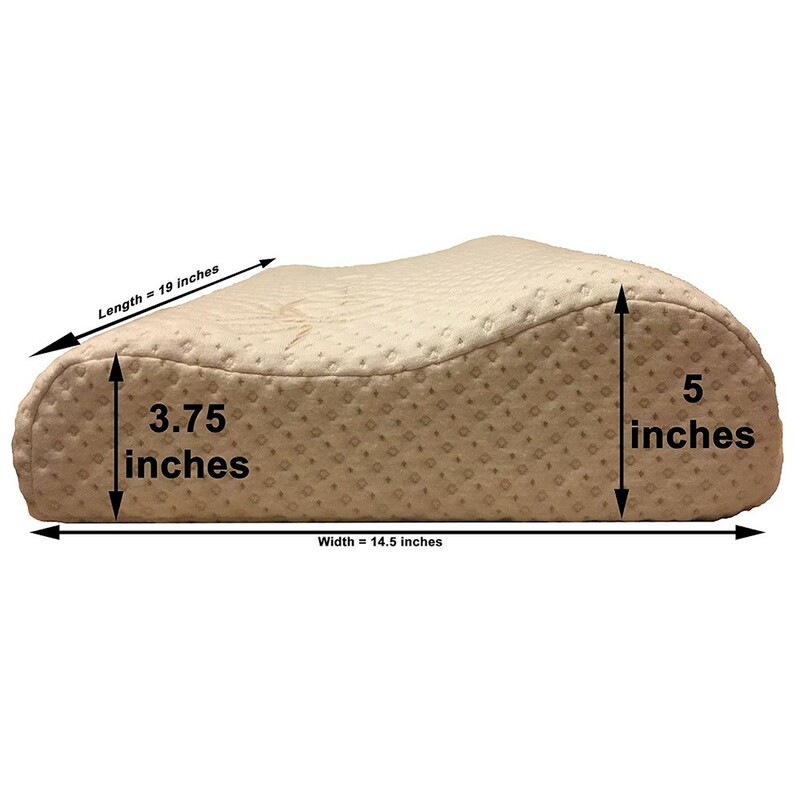 The higher edge may be more effective for a mild traction effect. 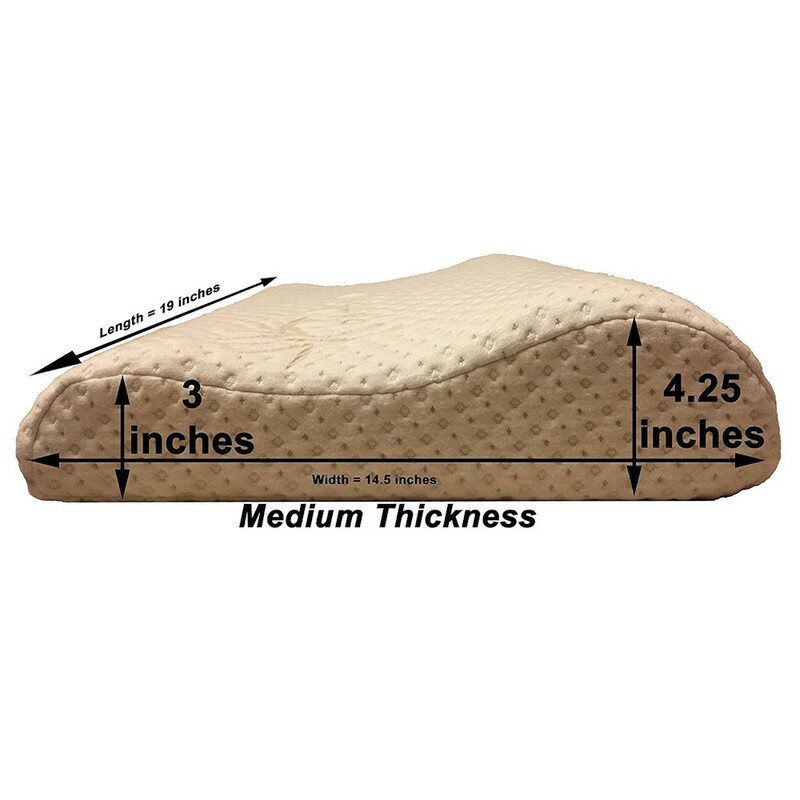 In general, the thick pillow is good for most adults, and the above guide is just that, a guide. 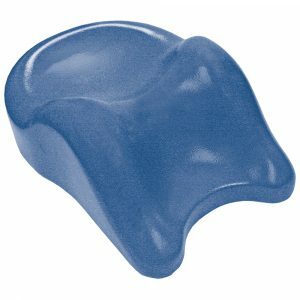 For kids, the thin pillow is perfect. You get 2 choices of sides to choose. Personally, I am about 6′ and use the thick version and sleep mostly on the lower height side. 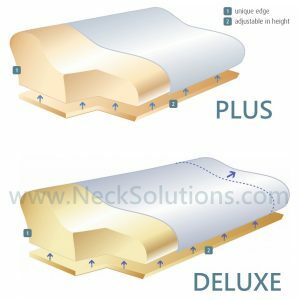 Your neck is designed to be a strong and flexible support for your head with its network of muscles, ligaments, bones and cartilage maintaining a natural curve. The cervical spine inside your neck is a naturally curved column of the top 7 spinal bones (vertebrae). During sleep, as muscles and ligaments relax, your neck can become distorted. Stress from improper motion and poor sleeping positions, can cause you to awaken tired and/or in pain! 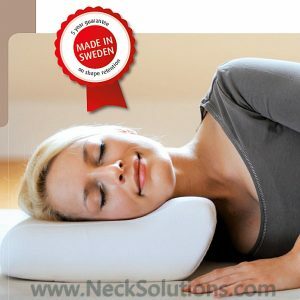 The chiropractic pillows improve posture while sleeping helping to restore the normal relationship between the head and neck. X-ray studies show improved position of the neck going from a standard pillow to a properly designed pillow. You can see the natural curve returning to the neck. Poor neck posture has been shown to be associated with many health problems including higher rates of neck pain, pain between the shoulders and headaches. The long term consequences of poor sleeping posture causes strain on neck muscles, disc bulges and herniations, joint inflammation in arthritis, and pinched nerves. 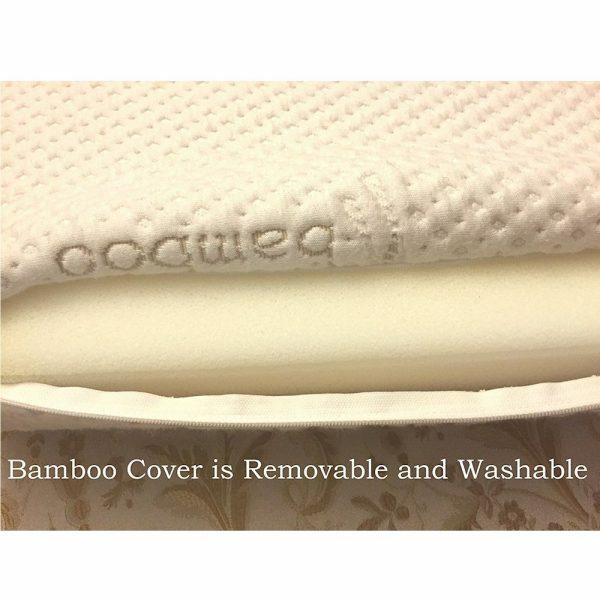 A great solution a Chiropractic Pillow that performs. 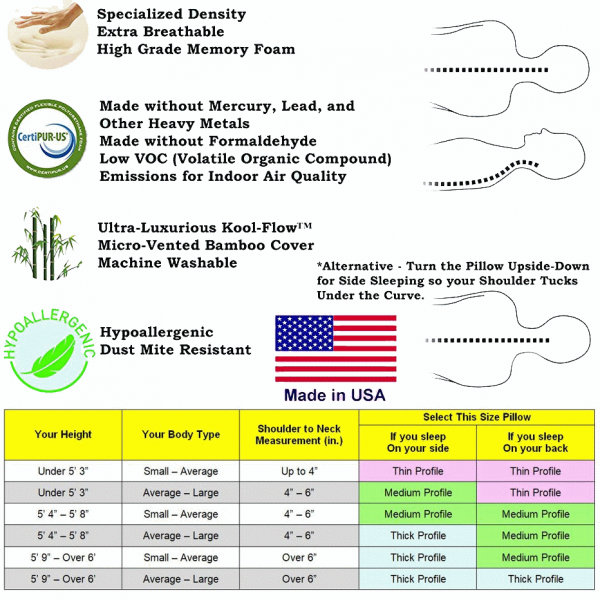 They are time tested in ergonomic benefit, made in the US and provide options for any patient and their condition. They are well tolerated and offer a gradual transition to better spinal health as well as accommodate both acute and chronic conditions.